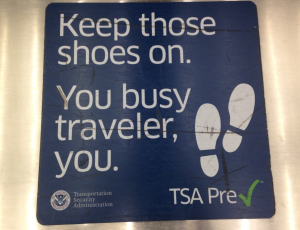 Every frequent traveler I know loves PreCheck. Sure, the lines back up at times, and there seem to be a lot of unknowing newbies slowing things down lately. But for the most part, PreCheck (and Global Entry) is the best thing to happen to air travel since the invention of the jet engine. When peak summer travel season hits in a few months, we’ll all be really happy and feeling very smarty-pants when can zip through security without taking our shoes, belts or coats off, and leaving our laptops inside our carry ons. If you have international travel on the horizon, there’s even more to be happy about. Today, the TSA announced that international carriers will soon participate in PreCheck. AP reports that Air Canada signed on with the program today, and that other foreign airlines are lining up to get in, too. To participate, airlines must first update their computer systems to embed extra information in their boarding pass barcodes and be able to print the PreCheck logo on them. I’ve used PreCheck so often that the wonderment of the experience has worn off. Yes, I get irritated when there’s a newbie in front of me. But I’m frequently reminded that the experience is indeed awe inspiring when I watch those first-timers, astonished that the shoes and the belt really don’t have to come off. And last week I received this email that shows just what it’s like. So for all you grizzled, jaded PreCheckers, take a read and remember what it was like YOUR first time! 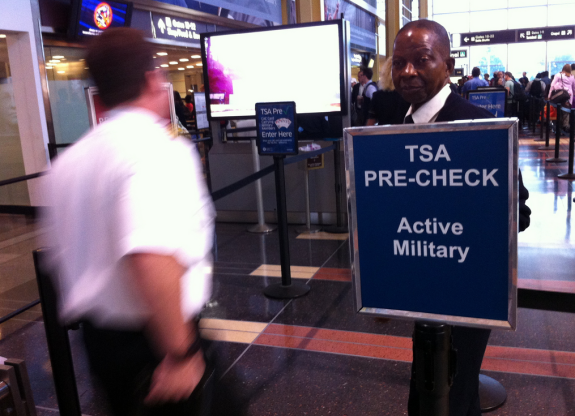 Have you had any personal experience with the TSA PreCheck program? 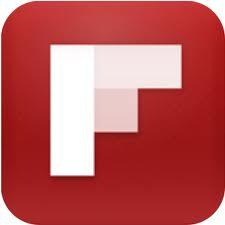 I have and it has made me one very happy customer– no make that truly ecstatic customer. I flew on United from SFO to MCO (Orlando, Florida) on April 9 and made the return trip yesterday. After I checked my bag at the United counter in terminal three I was directed to the Security line that at 7:30 am was quite long. I even went a little faster to get in front of a group of about twenty people that was gathering at the end of the line. When I presented my boarding pass the lady said, “You don’t need to use this line you need to go here” and pointed to the chute labeled “TSA Pre Check” with no one in it. So I basically just kept walking where the chute lead meanwhile passing everyone who was going through security. Finally I get to the end of the chute and there are only three people ahead of me. They were putting their stuff in the container to go through the xray machine. The TSA person is telling us that we don”t have to take off shoes or belts, or put laptops in a different container we just have to take anything metal and put it in the container. Then you go through the metal detector. All told it took about five minutes to get through security. I have to admit to feeling guilty pleasure as I walked by about 2 or 3 hundred people in line. So the only down side was that I was then left with a full two hours for 10 am flight. Coming back from Orlando yesterday the PreCheck even got better, because it allowed me to bypass I would estimate 5 or 6 hundred people mainly families from Disney World. The way the terminal in Orlando is set up you come to security from two ways, Terminals A and B. I saw a sign that said PreCheck was on the right side of A so I had to walk about three quarters of a circle to find the chute and again there was no one in line. I told the lady checking ids as I was getting my drivers license out of my wallet, that without having to wait in line I didn’t have time to get prepared. Fortunately the only one I was holding up was myself. Because the lines feed from two different entrances there were easily twice as many people I bypassed in Orlando as there were in SFO. Even though I was flying economy I was bypassing business and first class passengers. According to the United website it is done on a random basis, but believe me it made me feel like one lucky passenger. Don’t know if I should have gone out and bought a lottery ticket or not. I was going to Orlando to visit my sister and brother who I hadn’t seen in 6 years. My birthday was April 11 and my sister’s was April 13. Hope to see you again at SFO sometime soon.